Although RESET stresses that hard work and good habits are the key to success in life, I’m all for cutting a few corners. The road to financial independence is not an easy one. Anything that saves me time and makes my life easier, I embrace. This short post profiles nine under-rated tools/shortcuts – all featured in my book – that’ll smooth your path to FIRE1  and give you more time to do what matters to you. Let’s start with two tools to help you put things in context  and work out  how much tax you’re paying. Discovering where your salary places you compared to the rest of the world is humbling. Finding out your precise take-home pay is useful for personal financial planning (and also good to know if you’re going for a new job). #2 How much do you need when you retire? This is crucial. What type of life do you want to live when you retire and how much money will you need to fund it? Spare yourself an extremely laborious task that you’ll never get round to and instead read Which?’s 2017-18 member survey  of 6,000 retired and semi-retired couples. Examine the detail and work out – factoring in the tax you’ll be paying in retirement – the before-tax amount you’ll need to draw down as an income in retirement. When you’ve arrived at those figures, use the calculator to find out what age you’ll be when you become financially independent. Play around with F to see how this (the main variable within your control) affects matters. When do you want to reach financial independence and how much can you save each and every month? As I write, the full state pension is £8,546.20 a year, or £17,092.40 for a couple. Who knows what it’ll be in 15 years’ time but probably not a figure to be sniffed at. Check your state pension  online at gov.uk. Anything over £30,000 and you’ll need an IFA5  if you do want to transfer  (think carefully before you do!) and also be sure to check if the administrator is applying a percentage reduction to the CETV6  first. Final salary schemes that are in deficit are allowed to do this (again, it’s the law). These two tools work in tandem and are key to budgeting – an important and often time-consuming aspect of achieving financial independence. MSE’s Budget Planner  is a flexible spreadsheet, which breaks your outgoings down into intuitive categories. It helps you to see the effect that planned changes in spending will have, and thus to protect your all-important monthly saving figure. Money Dashboard  is a secure cloud-based open banking website that enables you to replicate and then track all the spending categories you set up in MSE’s Budget Planner. It syncs all members of your family’s current, business and savings accounts in one place. It even lets you set up ‘offline accounts’ to track things like VAT, pocket money, corporation tax – whatever you like. It gives you a real-time one-figure overview of your everyday money. If I had to track spending manually or by logging in to umpteen accounts, I wouldn’t do it. Money Dashboard is free and I believe it’s a game-changer for UK FIREers. For the biggest impact visit all three: Lidl, Aldi and Home Bargains. This one’s a no-brainer, albeit you may not want to take it to the extreme of using them all. Changing your weekly shopping habits from Tesco, Sainsbo’s, and Asda to the delights of the discount food stores could save you 30% – or in my family’s case £300 – on your monthly groceries bill. Financial independence is a philosophy of life. A different way of looking at the world. You’ve always got to be learning, reading, discovering – but you need to do this with intent, to challenge and enhance your worldview. To achieve this objective, you need to record what you think. Some people use emails, some Evernote, some Google Keep. I use index cards. You know, those little bits of white card with ruled lines on. I carry them everywhere and file them in boxes. They came in really useful when I was writing my book. Sound a bit old school? Perhaps. However, I’m in good company. Ryan Holiday, Anne Lamott, Robert Greene, Oliver Burkeman, Ronald Reagan, Valdimir Nabokov and Ludwig Wittgenstein (admittedly, he probably is a bit old school) all use(d) the humble index card to catalogue and organise their thoughts. Increased broadband speeds have transformed our lives. None of us would be familiar with people like Mr Money Mustache  or movements like FIRE if it weren’t for the Internet. It also means that communication has become democratised. Anyone anywhere can set-up a WordPress blog and sign-up for a free MailChimp account to broadcast their thoughts into the ether. Why would you want to do that? Well, if you’re into financial independence you’re probably into personal development, and you should definitely be into maximising your career earning potential. Blogging and setting up an email list sparks professional rejuvenation, helps you organise your thoughts, and future-proofs your career. WordPress  powers 30%  of all websites and is free. MailChimp  is free until you get 2,000 people on your list and it’s easy to use. Why oh why oh why is there not a free Personal Capital -type tool on our side of the Atlantic? You know, one place where you can synchronise all your bank accounts, where all your investment accounts also sync to – where you can do all your financial planning and have a handle on all your money and your money-based financial independence plans in one place. I like a good tool, but I don’t know a macro from my elbow. I have tried scores of FIRE-blogger spreadsheets and other systems that purport to make it easy for me, but they only seem to work in the US or in their creators’ heads. The everyday money thing I have sorted – Money Dashboard and Martin Lewis’s Budget Planner spreadsheet. Easy. But what about my portfolio? When Google sounded the death-knell to the full functionality of Google Finance Portfolio last year I was aghast. With that I had been able to manually input all my fund purchases and sales and get a lovely real-time-updated coloured chart saying how well (or badly) my investments were doing and what the rate of return was on each fund. (Useful when you’re making multiple fund purchases every month). I’ve tried replacing it with Yahoo Finance and the Morningstar portfolio manager, and I’ve even attempted to get to grips with the Financial Times Portfolio tool. None is perfect and I find myself increasingly falling back on a combination of my fund providers, Vanguard and Fidelity – a sub-optimal solution. So I’m wondering, how do you guys do it? What with the open banking reforms, why isn’t there a Personal Capital equivalent this side of the pond? How do you track your investment returns with the least hassle and in the shortest time? With that said, every cloud has a silver lining… and a consequence of the absence of one tool to rule them all is my finger isn’t drawn to checking my investments on a daily basis. That’s surely a good thing! David Sawyer (46) is a United Nations award-winning PR man and author. He lives in Glasgow with his wife, Rachel, young kids (Zak and Jude) and pet – Hamsterdam. 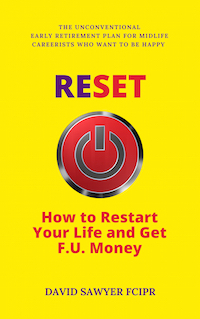 His first book – RESET: How to Restart Your Life and Get F.U. Money – is priced at just £0.99  for the Kindle version until midnight 3rd January. In addition, David has cut the price of the paperback to just £9.99 and Amazon has knocked a further 18% off today, bringing the price down to £8.23 . Get it while you’re in the mood for making resolutions!